In March of this year, I first worked with Newman’s Own Organics on a review and giveaway of a huge assortment of their delicious organic products. Since that time, the company that originally started as a division of Newman’s in 1993 until 2001 when it became a separate entity, developed two new fabulous cookies that I want to tell you about. I was sent their Oatmeal Chocolate Chip and Ginger Snap cookies for this review and giveaway. Both are made with organic flour, organic sugar, and healthier ingredients than typical packaged cookies. These are crisper cookies and the perfect size to grab when you are in the mood for a sweet. Forget about denying yourself because eating five of either variety only amounts between 130 and 140 calories for a small cookie feast! I enjoyed both new cookies and you would too if you sampled them yourself. Feel satisfied in your tummy and in your soul as well because through the sales of its products, Newman’s Own Organics generates money for the Newman’s Own Foundation for a wide variety of charitable organizations such as Hole in the Wall Camps. 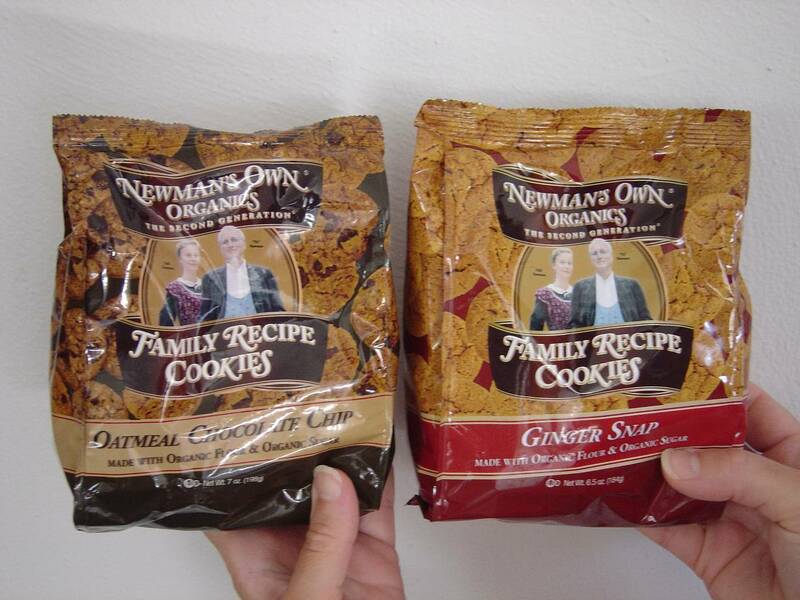 Thanks to Newman’s Own Organics, one lucky Nuts 4 Stuff reader in the United States wins both bags: the Oatmeal Chocolate Chip Cookies and the Ginger Snap Cookies! This giveaway ends September 1, 2011 at 12 PM Eastern Standard Time. The winner will need to respond to my email with name and shipping address within 48-hours or another winner will be picked. Previous Post Run Out of Gentle Detergent for Your Delicate Washables? I follow you on GFCcardprincess(at)sbcglobal(dot)net. I want to try their Dark Chocolate Bar! I follow GFC! I'd try the Dark Chocolate Bar! I'd like to try the Hermits. GFC follower: Atreau.I'd love to try the Fig Newman's. Thanks for the giveaway…we would like to try the Fig Newmans !senorpiero [at] yahoo [dot] comGFC Follower: Brian E.
Tweet: https://twitter.com/#!/brianpiero/status/109163281008177152senorpiero [at] yahoo [dot] comGFC Follower: Brian E.
Like Newman's Own Organics on Facebook: bryan easonsenorpiero [at] yahoo [dot] comGFC Follower: Brian E.
… is already subscribed to the mailing list of Nuts 4 Stuff.senorpiero [at] yahoo [dot] comGFC Follower: Brian E.
I follow. I'd like to try Light Butter Flavored popcorn.